Circa 1890. The 1890 King-Keith House Bed and Breakfast is listed in the National Register and boasts twelve-foot ceilings and carved fireplaces. One of Atlanta's most photographed houses, this Queen Anne Victorian sits among live oaks and prominent homes in the restored neighborhood of Inman Park in Georgia. Play the baby grand piano in one of the elegant public rooms and stroll through private gardens. Enjoy complimentary snacks and beverages. Romantic guest rooms offer a variety of pleasing amenities, gorgeous antiques and some feature clawfoot tubs. The Downstairs Suite includes a Jacuzzi tub, living room and private entrance off the front porch. The spacious Cottage is a honeymoon favorite with a double Jacuzzi. Linger over a gourmet breakfast served with generous southern hospitality at this Atlanta inn. 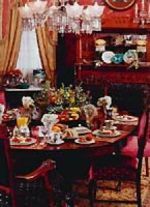 Publicity and Awards: Southern Living, Victorian Homes (cover), Collector Inspector, HGTV. Types of Meals: Early Coffee/Tea and Full Breakfast. Amenities in Room: Air Conditioning, Cable TV, Reading Lamps, Refrigerator, Ceiling Fans, Snack Bar, Clock Radio, Telephone, Desk, hair dryer, cottage with Jacuzzi and fireplace. Amenities on Site: Parlor Games. Events Hosted: Reunions, Seminars, Meetings, Weddings, Romantic Getaways and Parties/receptions. All Activities: Antiquing, Golf, Live Theater, Parks, Shopping (Local Crafts), Sports Events, Major, College, Tennis and restaurants. Historic Membership: City Historical Society. Vaulted ceilings and large space great for romantic getaways, including honeymoons and special occasions. Includes King-size bed, gas fireplace, full bath with Jacuzzi tub for two, refrigerator and coffeemaker. Located for privacy in elegant garden with fountain. Cable TV and phone. Private sitting room with extra twin bed, Queen-size bed in adjoining bedroom, Jacuzzi tub and private bath. Stained-glass window and private entrance from front porch, cable TV and phone. King-size bed and Empire furnishings. Private bath with clawfoot tub and shower overlooking gardens, cable TV and phone. Features stained-glass and Victorian collections. 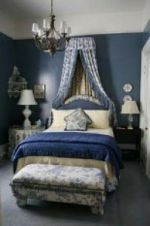 Queen-size bed, Victorian furniture and antiques, private bath with shower only. Cable TV and phone, additional twin bed. Queen-size bed, antique brass bed and wicker furnishings, extra twin bed. Private bath in the hall with clawfoot tub and shower. Cable TV and phone. Double- (full) size bed, beautiful Victorian bedroom set. Private bath in the hall with clawfoot tub and shower. Cable TV and phone.